Limassol lies almost exactly in between Paphos and Larnaca airports, so you can choose from car hire in Paphos airport or car rental in Larnaca airport – depending on where your flight to Cyprus lands! From either airport, it's an easy drive in your Cyprus hire car to join the modern motorway than runs around the south coast. Your hire car gives you the freedom to explore the magnificent scenery around Limassol that lies just beyond the motorway. Let's face it, day one, you'll probably drive your Limassol hire car to your hotel or apartment and breath a great sigh of relief! Limassol's beaches and the warm waters of Akrotiri Bay are a great place to relax. As you gaze upwards from you sunlounger, you'll see the Troodos Mountains rising in the distance. And sooner or later, you'll just have to get up and explore them for yourself! Why not let Cyprus-car.com organise your car hire in Limassol; we'll deliver a neat compact car or a fun 4 wheel drive jeep to your hotel or apartment, complete with a full tank of petrol. All you have to do is slap on the sunscreen and drive for the hills! Just a few kilometres from Limassol, the pretty villages of the Troodos Mountains reveal the relaxed side of Cyprus, where heavy traffic means two lorries on the roads at the same time! As the roads wind through the foothills, you'll want to park your Limassol rental car for a while to wander amongst white-washed houses, then perhaps enjoy a cool drink at a small café in the village square. Why not try the local wines produced in the vineyards that cover the hillside; since we offer a second driver for free with all rentals, at least one of you can sample the wines properly! Your Limassol car rental firm can point you towards the uncrowded Lady's Mile beach, although you might get the occasional fly-by from the nearby RAF base on the Akrotiri Pensinsula. Then drive on to the Roman town Kourion to explore, with its amazing views and magnificent amphitheatre. 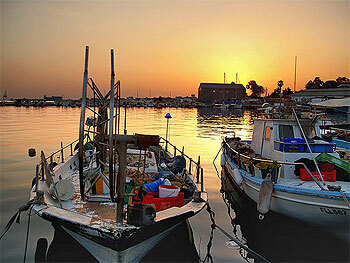 With a Limassol car rental, this part of Cyprus is yours to explore and enjoy.